If you've been consuming any sort of media in the wake of the release of the Senate Intelligence Committee's CIA torture report, you've likely been bombarded with stunned and disgusted pundits. Rectal feeding? Sleep deprivation? Not in my America. But that's actually not how half of the country feels. According to a new poll from Pew Research Center, 51 percent of the country feels that these methods were justified, while only 29 percent think they were unjustified, and 20 percent did not express an opinion. Perhaps unsurprisingly, these opinions were largely divided along party lines. 76 percent of Republicans approved of the CIA's methods, while Democrats were divided (only 46 percent of Dems felt the techniques were unjustified). The word "torture," it should be noted, isn't mentioned in the poll, but it has been associated with much of the coverage of the issue. 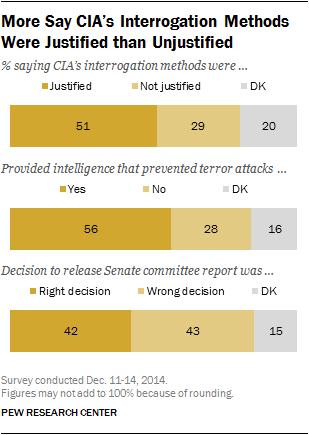 And the numbers align nicely with polls on the use of torture, which shows that relatively few Americans are concerned about it -- especially when you bring the prospect of combating terrorism into the mix. That lack of real concern about what the CIA was doing is also reflected in the amount of interest in the story. While newspapers and broadcast news across the country devoted a huge amount of coverage to the Senate intelligence committee report last week, just 23 percent of Americans say they are following the story "very closely," while 50 percent are following it "not too closely" or "not at all." That ranks it behind the Ferguson/Eric Garner protests and stories about the U.S. economy. And it's not just that people who aren't concerned about torture aren't tuning in. Those who have followed the story the most, in fact, approve of the program 59-34 percent. The study was based on phone interviews conducted from December 11-14 with 1,001 adults living in the continental United States.